We know, back emf Eb of a DC motor is the induced emf in the armature conductors due to the rotation of armature in magnetic field. Thus, magnitude of the Eb can be given by the EMF equation of a DC generator. It is already explained above that the speed of a dc motor is inversely proportional to the flux per pole. Thus by decreasing the flux, speed can be increased and vice versa. To control the flux, a rheostat is added in series with the field winding, as shown in the circuit diagram. Adding more resistance in series with the field winding will increase the speed as it decreases the flux. In shunt motors, as field current is relatively very small, Ish2R loss is small and, hence, this method is quite efficient. Though speed can be increased above the rated value by reducing flux with this method, it puts a limit to maximum speed as weakening of flux beyond the limit will adversely affect the commutation. Speed of a dc motor is directly proportional to the back emf Eb and Eb = V - IaRa. That means, when the supply voltage V and the armature resistance Ra are kept constant, speed is directly proportional to the armature current Ia. Thus, if we add a resistance in series with the armature, Ia decreases and, hence, the speed also decreases. Greater the resistance in series with the armature, greater the decrease in speed. In this method, the shunt field is connected to a fixed exciting voltage and armature is supplied with different voltages. Voltage across armature is changed with the help of a suitable switchgear. The speed is approximately proportional to the voltage across the armature. This system is used where very sensitive speed control of motor is required (e.g electric excavators, elevators etc.). The arrangement of this system is as shown in the figure at right. M2 is the motor whose speed control is required. M1 may be any AC motor or DC motor with constant speed. G is a generator directly coupled to M1. 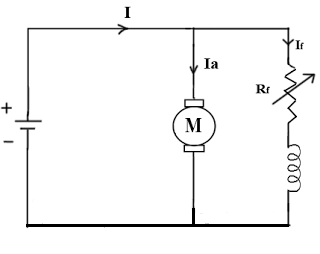 In this method, the output from the generator G is fed to the armature of the motor M2 whose speed is to be controlled. The output voltage of the generator G can be varied from zero to its maximum value by means of its field regulator and, hence, the armature voltage of the motor M2 is varied very smoothly. Hence, very smooth speed control of the dc motor can be obtained by this method. 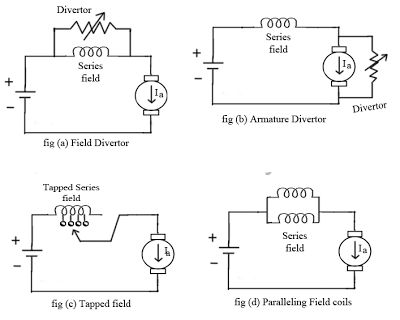 Field divertor: A veritable resistance is connected parallel to the series field as shown in fig (a). This variable resistor is called as divertor, as the desired amount of current can be diverted through this resistor and hence current through field coil can be decreased. Hence, flux can be decreased to the desired amount and speed can be increased. 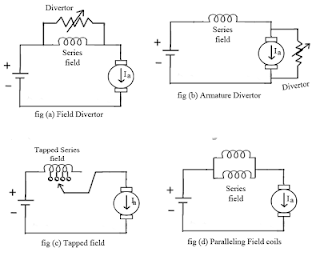 Armature divertor: Divertor is connected across the armature as in fig (b). 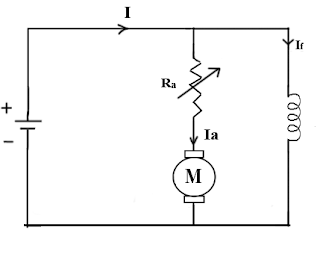 This will result in an increase in current taken from the supply and hence flux Ø will increase and subsequently speed of the motor will decrease. 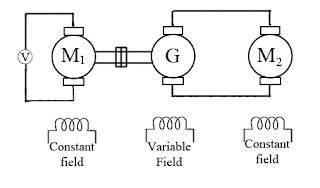 Tapped field control: As shown in fig (c) field coil is tapped dividing number of turns. Thus we can select different value of Ø by selecting different number of turns. 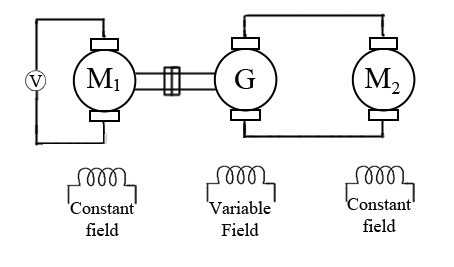 Paralleling field coils: In this method, several speeds can be obtained by regrouping coils as shown in fig (d). By introducing a resistance in series with the armature, voltage across the armature can be reduced. And, hence, speed reduces in proportion with it. This system is widely used in electric traction, where two or more mechanically coupled series motors are employed. For low speeds, the motors are connected in series, and for higher speeds the motors are connected in parallel. When in series, the motors have the same current passing through them, although voltage across each motor is divided. 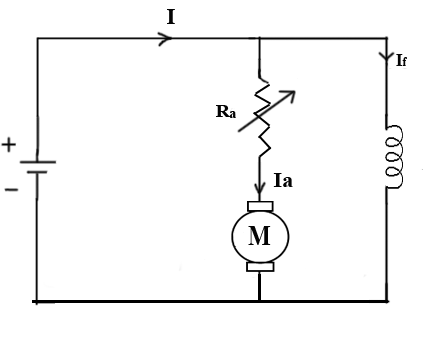 When in parallel, the voltage across each motor is same although the current gets divided.